I first met Marie Wilcox when I was about 14 years old. Back then she was selling Bessemer ware and my mum brought some products for our small business. Little did I know that she would have such an impact and influence on my later adult life in SCOPE. Marie joined SCOPE in July 1980 as a charter member. She held most executive roles over her 38 years with the organization. Marie was National President for 2 years and was awarded the Neil Andrews Award and received both Club and National Life Membership. When I joined SCOPE in 1987 our membership was very small. Maree asked me to accompany her on the long drives to Allora, Stanthorpe and Toowoomba for all of their Changeover Dinners, Functions, Zone, and National Conferences. I remember the long drives and that we would talk about anything and everything all the way there and back. We certainly learnt a lot about each other’s lives and experiences. We would often have to bunk together overnight. When Marie married George May, he would then accompany us on our adventures. We would often stop off somewhere on the way because Marie had heard of a goods and chattels auction or a special event that she would like to attend so our trips were never without variations. National Conferences were always a chance to show off our acting skills. Marie loves a good skit; I was always terrified with what she had in mind. We would decide on something and then get to work organizing props and dialogue and practice the routine over and over again. George would always be there to critique our performance and offer constructive criticism. Some of our skits like “Happy little Vegemite’s” and “Two Old Ladies Locked in the lavatory” gained us standing ovations and cries of more more. For the Happy Little Vegemite’s we sewed roses on our cheeks and not the ones on our faces. There were too many to list, needless to say we had a ball. When Marie become National President, I travelled with her when she toured to the clubs and I learnt much as I went, eventually taking on the position myself with her encouragement. 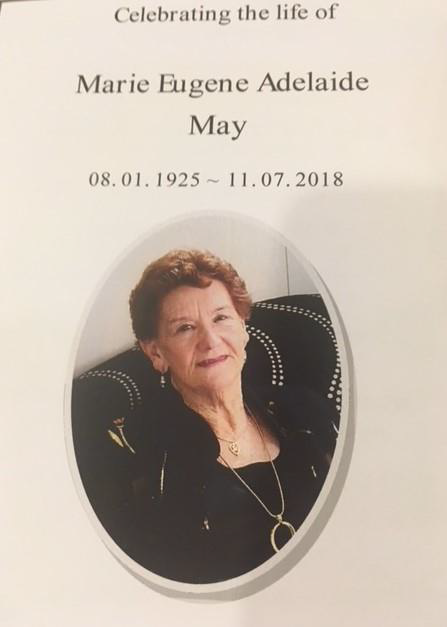 Marie was truly dedicated to SCOPE and its ideals. She campaigned to have Australia Day Holiday recognized on the 26th not just the closest Monday, and to have SCOPE participate in the celebrations. SCOPE was very dear to her heart and she fought for its continuation and growth. She dedicated a very large part of her life to it. Christmas Parties, Fashion Parades, BBQ’s all of these were celebrated at her home in Lennox Head. She loved to entertain and was always up for a bit of fun.